Said to have originated in Poltalloch, Scotland, the West Highland Terrier came from the same stock as Scottish Terriers, Cairn Terriers, and Dandie Dinmont Terriers. Although White Terriers have been recorded as far back as the 1500s, the development of the modern breed is given credit to Edward Donald Malcolm who sought to breed a white terrier so that his hunting dogs would not be mistaken for foxes. The breed was brought to America in 1907 and was recognized by the AKC in 1908. 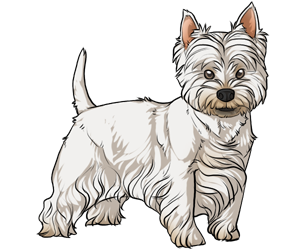 Today, West Highland Terriers, or Westies, make for good family companions as well as good rodent hunters. The Westie is susceptible to a condition known as Craniomandibular osteopathy or "Lion jaw" where the dog develops an overgrowth in its jaw. The breed is particularly popular in the UK and is in the top third most popular breeds in the United States.